Greg and Jill Henderson are behind a hoverboard that uses a magnetic field to generate lift, and they have turned to crowdfunding to put the finishing touches on their California-based Hendo Hoverboard. They said that "perfecting it will take a little more time and resources," and their target date is October 2015. Their plan is to procure parts from a number of overseas suppliers, with the final assembly in Los Gatos, California. Engadget described it as "a self-powered, levitating platform with enough power to lift a fully grown adult." The technology behind the hoverboard lies in its four disc-shaped hover engines. These create a special magnetic field that pushes against itself, generating the lift that levitates the board off the ground. There is work ahead. The surface needs to be a non-ferromagnetic conductor. "Right now we use commonly available metals in a simple sheets, but we are working on new compounds and new configurations to maximize our technology and minimize costs," the team said on the campaign page. The campaign's hoverboard is a means for the company to draw attention to a larger development, the device's technology, and the developer kit option could open up opportunities to leverage this technology in important ways. "We are putting hover technology in YOUR hands," they said. The New York Times said the Hendersons would like to see new industries based on this science. Greg Henderson, CEO of the company, Arx Pax, said the underlying technology is totally scalable. "The Hendo hoverboard is just the first step," he said. "It's a proof of concept for demonstrating a technology that everyone can understand." Campaign supporters who go for the option of a developer kit will find inside the box the hover engine, to use to build their own projects. "You no longer have to be a scientist in a lab in order to build the future," he remarked. "The wheel may finally have some competition." Their hoverboard is a "vehicle," in a sense, for the core technology which the Hendersons call Magnetic Field Architecture (MFA). As the campaign page explained, "The Hendo Hoverboard is a first-step product," with a vision toward broader MFA implementations. "It enables a new generation of lift and motion technology that will change the way we view transportation. Additional applications for MFA technology are virtually limitless - from business, to industry, to healthcare, and beyond." The team would like to see an ecosystem of technologies using MFA. "Hovering modes of transportation are now possible and practical. Lifting a wide range of loads - whether it's a person riding a hoverboard (what we were all expecting) or a building riding out an earthquake (what we never imagined could be possible) - is all within reach." Another vision is to see a place for using the hoverboard. They said that as their current technology requires special types of surfaces, "we need a hoverpark to go with our boards, and we have been busy designing a park befitting the awesomeness of our technology." Arx Pax developed the hover technology used in the Hendo Hoverboard and Whitebox Developer Kit. For a pledge of $10,000, they said, one can own one of the world's first ten Hendo production hoverboards. I have a bridge in Brooklyn for sale, anyone want to buy it? In other words, I am extremely skeptical of this; I will believe it when I see it. As the article here clearly states, a non-ferromagnetic conductive surface is required, which severely limits the novelty and potential range of applications; we already have maglev techs. What is surprising, or incredible, is that they're managing to do so at a sufficient level of force without running out of batteries in 30 seconds, because it does require quite a tremendous field strength to lift a man, and they're basically operating an air-core transformer that is completely shorted out at the other end, so it's wasting a ton of power simply to heat. There's a passive version of the hover mechanism that uses a halbach array of permanent magnets with a bunch of copper coils as the hover surface, where moving the magnets laterally causes the coils to repel them. With sufficiently strong magnets and sturdy coils, one can levitate a train car as long as its moving at a walking pace or faster. The faster the speed, the stronger the repulsion. The basic principle is used in maglev trains, where the levitation force is used in two directions at once to provide a centering force for the train car that keeps it from flying off the track. Warehousing... limited area, though large but easy to add conductive surface take amazon's kiva https://www.youtu...juuEVEZs <- watch the video. Now you can potentially reduce the power consumption by providing a frictionless surface for travel. Port Authority... same principal as above but with massive heavy containers. literally replace the wheel... and the axle for that matter ... factories, any industrial area would possibly see huge gains with this tech. Coupled with LM skunkworks promise of fusion generators the size of a semi-truck with an under 10M USD price tag... then this opens up huge savings through robotics. It will change the way we create almost all mechanical devices that can be automated. Friction is the energy consumer, and heat is the evidence of it's passing. I considered such applications but felt they weren't worth mentioning since the controllable friction afforded by passive wheels is far more practical. Again, the need to lay conductive flooring is problematic. Presumably high freq / low duty cycling minimizes losses. If the tech generates flux loops then these can have negligible maintenance overheads. High permeability materials, likewise. Also, the incompatibility with ferromagnetic materials (ie. high remanance, high coercivity) is consistent with a fast alternating system. An analogy might be the EM locks often found on security doors - formidable strength, with low operating costs. Basically we only need to spend energy to initiate the field - once created, it sustains itself unless interrupted. Also, a common misconception is that the input energy must be used to perform the domain changes in the induced material, however this is actually powered by ambient heat - irrespective of the energy needed to apply the field. I'm frankly astounded that this made it all the way to Physorg. It's a scam, pure and simple. Any 1st year physics student could do this - it's a simple application of Lenz's Law. I could build the same thing myself, it wouldn't even take a full day to do all the math and schematics. The reason this stuff isn't out in the public is that it is USELESS. It only works over very conductive surfaces, such as thick copper plating. It's also very inefficient - it requires very large currents to generate useful forces. That means that any battery powered device will get sucked dry in moments. In this case it goes dead in just 12 minutes - and that's after packing the thing to the brim with high density LiPo batteries. And last time I checked, the Kickstarter had over $100k pledged - disturbing if you ask me. If it works as described its not a scam. I imagined a hoverboard concept like this based on the Inductrack technology developed for maglev trains and the like. 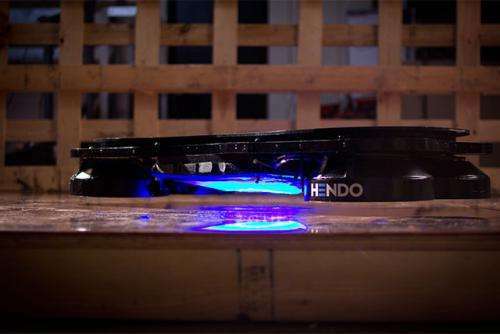 The Hendo hoverboard seems to rely on rotating magnets to act as the moving magnetic field which generates a lifting reaction from the embedded induction 'coils' in the supporting surface. It seems each hover engine consists of an electric motor powering a rotating 'hover' magnet array. I assume permanent magnets are employed here to save on magnetising power. Four reaction motors are used to maintain trim, torque and gyroscopic balance. Still waiting for the inverse-gravity drive. Lots of concrete skateboard parks around which make good money. A metal half pipe might work. I wonder if they could use induction to provide power or keep the batteries charged?